Paramendra Bhagat, a budding entrepreneur, wanders around the cream of New York's tech scene, shaking hands and making contacts. This is the NY Tech Meet-Up, a well-known monthly gathering of more than 700 people, including venture capitalists (VCs) looking to fund the next Facebook. Sitting in a large auditorium in Chelsea, there is a crowd of hip, skinny people and the earliest of early adopters. One man ignores all the presentations to watch live baseball on his iPad - four days after it launched. "I'm here because this is where all the opportunities are, in New York," Mr Bhagat says. After the presentations finish and the mingling begins, he goes around talking to the investors, telling anyone prepared to listen about his start-up, which aims to bring poor people in the Indian sub-continent online. But Mr Bhagat is from Nepal, and despite having been in New York since 2005, US visa regulations mean there is no easy way for him to stay in the US as an entrepreneur. Even though, he says, "there are immigrants who want to come, and VCs who need them". A new law currently in the Senate aims to change the status quo. In February, Senator John Kerry, the former Democratic presidential candidate, and Republican Senator Richard Lugar introduced the Start-Up Visa Act in the Senate. The bill would create a new category of visa that allows any foreign citizen who is able to raise at least $250,000 from venture capitalists, or so-called "angel" investors, to come to the US. The entrepreneur would become a permanent US resident once the business has created five jobs, or achieved $1m in revenue, or if the visa holder has managed to raise a further $1m. Paul Graham, from the Californian start-up funders Y Combinator, proposed the idea in an essay last year, which was then taken up by others, including Brad Feld, a software and tech investor based in Boulder, Colorado. "We're stupid if we limit ourselves in any way as a place to start businesses," Mr Feld says. Last summer, he ran a bootcamp for young start-ups, which included entrepreneurs from abroad. Two wanted to stay in Boulder to continue working on their companies. "We searched and searched but we were literally unable to [help them stay, as] there was no valid visa," Mr Feld says. "I thought it was insane that we weren't making it easier for entrepreneurs to come over here." Both the start-up founders - one Canadian, one European - returned to their home countries and raised $450,000 and $1.3m, respectively, and are now growing small businesses. Ever since that experience, Mr Feld has been running a campaign to have a visa for budding entrepreneurs. There is a current visa - the EB-5 - that gives entry to the US to investors who are willing to put in $1m and create 10 US-based jobs. These visas are capped at 10,000 a year, but are hardly used. In 2009, US Citizenship and Immigration Services approved a total of 1,265 applications, up from 640 in the previous year. What Mr Feld and the Senators have proposed is to split the EB-5's allocation in half with the new visa - the EB-6. With this, they hope to side-step the thorny and ongoing debate about immigration reform that is currently going on in Washington. In fact, speaking to BBC News, the White House says it has yet to decide its position on the start-up visa. And with a likely battle of the next nominee for the Supreme Court due this summer and the climate change bill to be debated, many fear that immigration is not to be tackled politically any time soon. "There's always going to be people who say 'don't let anyone into the country'," Mr Feld says. "We view this as job creation rather than part of immigration reform." Indeed, the investing community loves the proposal. When Mr Kerry and Mr Lugar debuted the bill, more than 100 VCs signed a letter supporting its passage. "The average person thinks that immigrants are taking jobs away from US citizens," says Mark Heesen, president of the National Venture Capital Association (NVCA). "There's such angst on jobs, jobs, jobs and angst on immigration, so this marries the two." Besides the difficulties of foreigners coming to the US, the visa itself also plays into anxieties of the US's role as the world's most powerful economy in the aftermath of the global recession. The economies of India and China - hotbeds for software and scientific talents - have continued to grow and the best and brightest are either returning home, or not leaving in the first place. Many high-profile scientists have come back to take senior teaching and research positions at respected and well-funded Asian universities, for example. The US is also reliant on foreigners coming to the US to do business. An NCVA-backed report from 2008 said that immigrants have started 25% of US venture capital-backed public companies over the prior 15 years. The report said that most foreign entrepreneurs came from India, followed by the UK, China, Iran, and France. "In some areas, like cleantech, we're playing catch-up," Mr Heesen says. But, he adds, "we have a much more expeditious economy than in the past [and] we're still number one when it comes to creating and attracting entrepreneurs". 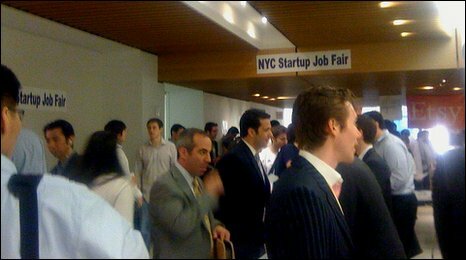 Soon after the NY Tech Meet-Up, a job fair is held in AOL's building not far from Union Square. 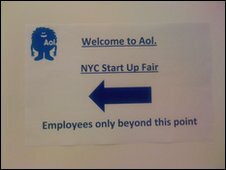 The scene is yet another reminder of the emergence of Silicon Alley, the New York tech scene's nickname, as a force. Organised by the 22-year-old Alex Horn as a small gathering of college graduates who meet the city's newer start-ups, the jobs fair ballooned online and 1,150 people signed up to attend. Mr Horn's father, a Brazilian, was himself a beneficiary of the EB-5 visa. "I wouldn't be here today if there hadn't been a push to have that law passed," he says. The fair is a packed floor of ambitious young people eager to impress the socially awkward members of some of the coolest companies in the city. The hipster's favourite, Etsy, which acts as a market for handmade goods, is hiring, for example. At the fair, Anand Sanwal tells a prospective applicant that it is very difficult to sponsor a foreigner to join. Mr Sanwal, who works for CB Insights, which tracks the development of cutting-edge small firms, is sceptical about the law, and is worried about people taking advantage of the system as an easy route into the US. Standing next to him, waiting for an opportunity to speak, graduate student Ragu Sundaram, 32, from Chennai, is very much in favour of the visa idea, however. 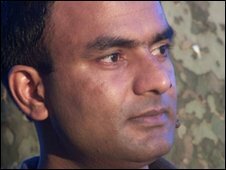 But Mr Sundaram is concerned about whether young entrepreneurs starting out would be able to cope with the additional pressure of having to get to $1m in two years or face being deported. "Starting a start-up is no easy thing, and this is more work," he says. Mr Feld says that potential entrepreneurs need to meet a high bar to be in the US and compete with locals. "Yes, it is pressure, but we're facing pressure anyway," he says. Mr Feld takes a VC's approach to what might happen if it all goes wrong. "Failure is okay," he says. "There is nothing to say that you can't raise another $250,000 and start another business. "Failure is part of entrepreneurship."